For the beginning of the week we are guided to the message, POSITIVE THOUGHTS CREATE POSITIVE RESULTS: Divine love and wisdom, I call upon you now. I know that my mind and emotions are eternally and continuously connected to you. I ask my higher self to be aware and conscious of the love and light that is within every person and situation. We are reminded that ultimately we are responsible for what is showing up in our lives. Pretty big assignment? You bet! We are being reminded of just how powerful we are and that we have the ability to shift our thoughts or frequency to a higher more positive vibration. By observing our thoughts, speaking and writing we can see where we have been casual in creating what we really want versus automatically reacting to what is happening around us with people and situations. This is not always easy! Don’t worry it is a life long practice. By using affirmations one can train oneself to do this. You may want to get a book and read about them, adopt a daily (or hourly) practice of saying positive affirmations. We’re asked by Michael to avoid blaming yourself or others and instead focus on the solutions. Rather than worrying about something, pray and practice a loving compassionate state of mind. The prayer is: Divine love and wisdom, I call upon you now. I know that my mind and emotions are eternally and continuously connected to you. I ask my higher self to be aware and conscious of the love and light that is within every person and situation. For the middle of the week the guidance is, ADMIT THE TRUTH TO YOURSELF AND ACT ACCORDINGLY: I appreciate your support in helping me face my feelings with grace and acceptance so that I can be lovingly honest with myself and others. Thank you, Archangel Michael for giving me courage and strength. Here the message is to allow yourself to be fully present to a situation or relationship that may not necessarily be pleasant and take the appropriate action you already know is required. You can ask Michael for courage and strength for this. Also, by clearing yourself of any lower emotions and or energies you can be more peaceful and focused. On my radio show from Saturday I spoke about this. The prayer is: I appreciate your support in helping me face my feelings with grace and acceptance, so that I can be lovingly honest with myself and others. Thank you, Archangel Michael for giving me courage and strength. And towards the weekend, the message is, GUARDED AND PROTECTED: Thank you for protecting my loved ones and me, ensuring that we’re safe and that all of our needs are met. I now accept your help gratefully and gracefully, knowing that it’s right for me and all others to accept heavenly assistance. Archangel Michael is reminding you that you are not alone and have a partner in this situation, as well as on other areas of your life. You and the archangels are a team! You follow the guidance they give you through your intuition. 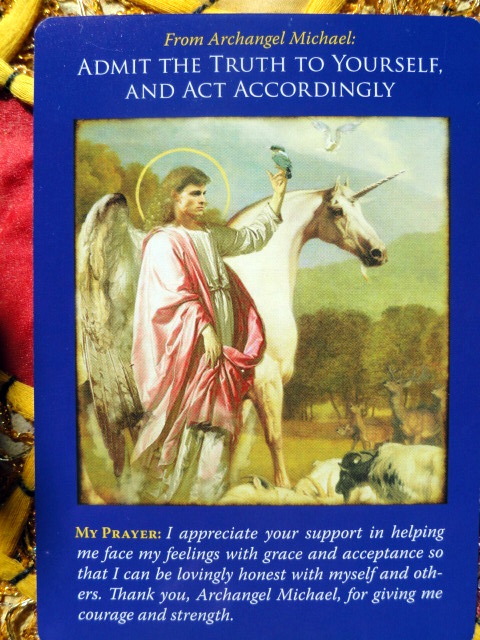 You likely drew this card because you’re going through a major life change and are feeling vulnerable, but this is a symbol to remind you that Michael and the angels are with you. This message ties in to the previous two as it reminds us that we can courageously move forward with what we want to create and that are needs will be met. 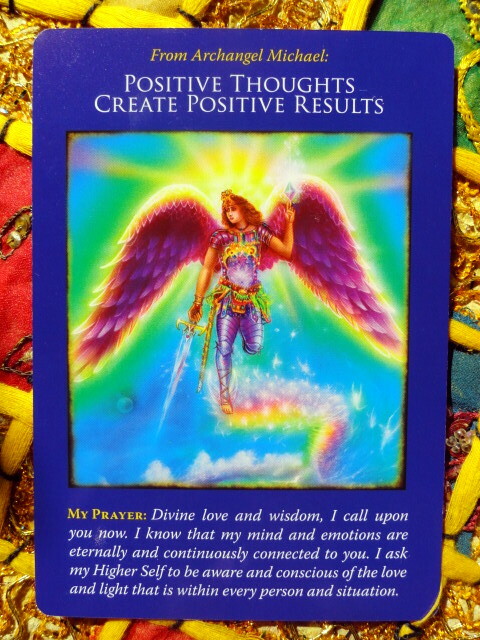 This message also reminds us that we can be more trusting in our relationships with people and the angels. Go ahead and open your heart to giving and receiving love so that you can experience the intimacy you deeply desire. The prayer is: Thanks for protecting my loved ones and me, ensuring that we’re safe and that all of our needs are met. I now accept your help gratefully and gracefully, knowing that it is right for me and all others to accept heavenly assistance. It looks like a week of being present to the love and power in our relationships and life. If we don’t like what we see, we have the power to shift our thoughts and speaking to create what we desire, and to take necessary actions where they are required. 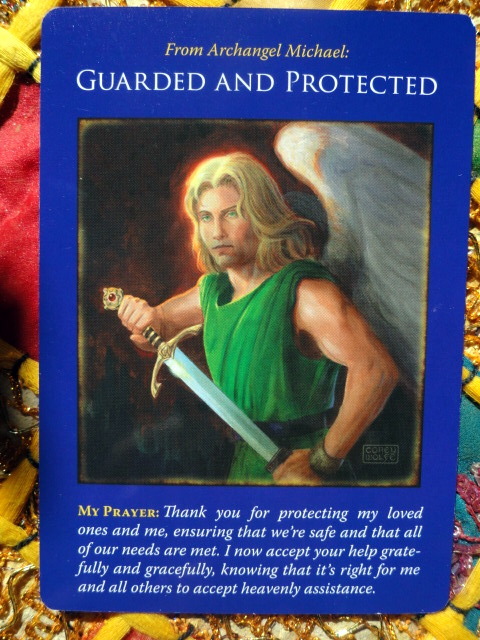 We then allow the grace and ease that is available for us by calling upon our angels and Archangel Michael for support!